I have admitted here before that I’m much better (and more confident) with cooking than I am with baking. Part of the reason why I chose to bake everyone’s birthday cakes when I started this blog was to fine tune my baking skills, which in my opinion needed a lot of sharpening. And still do! What I don’t think I’ve mentioned, however, is my fear of yeast. I’ve been writing this blog for over a year, and I’m not sure if anyone’s noticed that I haven’t baked one thing that included it. Until now. A few weeks ago I got my Secret Recipe Club assignment for the month. I perused the blog that was given to me and came across what I considered to be an easy bread recipe. Yes, it required yeast, but I mentally prepared myself for it. So, off I went to Trader Joe’s, and purchased my first packet of yeast. The next day, I got an email from SRC that our assignment for the month was canceled. But, the trooper that I am decided to continue with facing my fear and bake the bread. Yeah…a woman on a mission. Go me! Grease a 9×13 baking pan with some of the remaining oil. Remove bread from bowl and gently press into pan, working it out so it reaches all edges. Lightly coat a piece of plastic wrap with oil and cover dough again. Let rise for 30 minutes. This entry was posted in bread, garlic, yeast. Bookmark the permalink. Go to http://secretrecipeclub.com/ – there should be details regarding how to join! Yeast is intimidating! It’s so…persnickety and unpredicatable! 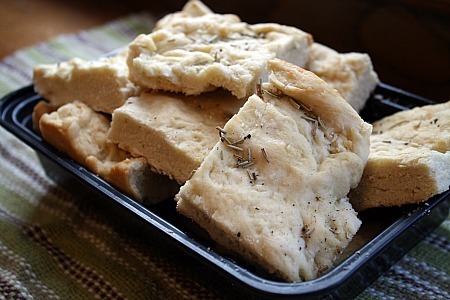 The foccacia looks amazing! I didn’t like foccacia until I made homemade…so much better! I used to be scared of baking with yeast…until I made a resolution two years ago to not buy bread and only bake my own for a year! Now it’s just kind of second nature. It definitely gets easier the more you do it! (And tastier!) this bread sounds delicious! I’m terrified of yeast-especially since my first 2 attempts were FAILS!! Just bought more on a whim. Will try this recipe! Thanks Melissa!! This must be a family phobia…but now that you’ve conquered it, I might just have to try it as well. Wish me luck! Can’t go wrong with garlic right in the bread, can you? It looks like it tastes wonderful.